The BarTab EPOS starter pack has everything you need to turn your BarTab EPOS free trial iPad into a fully fledged pub EPOS system. The starter pack includes Star’s direct connect thermal printer that links directly to the iPad with the lightning cable, so there is no reason to run any cables. The cash drawer is the Star CB2002, which connects straight into the back of the printer. The CB2002 is a robust cash drawer, perfectly suited to the high volume nature of bar service. If you run a small bar pub or bar, and prefer to pay your fees monthly, the BarTab EPOS Starter Pack could be a good choice. If you prefer to pay your fees annually you would be better suited to the BarTab EPOS Annual Pack. 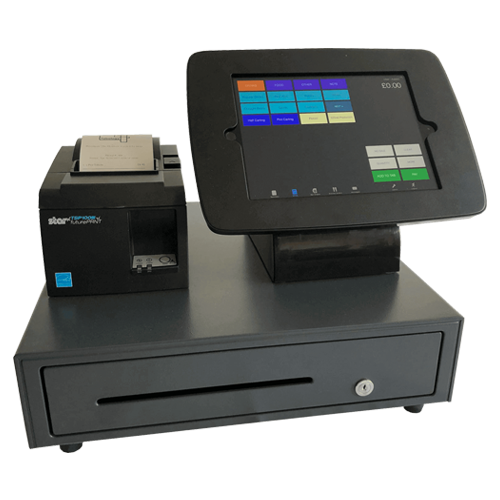 If you run a large pub with multiple EPOS terminals multiple starter packs may still be the right option, though it’s best to speak to one of our team who can advise based on your set up.